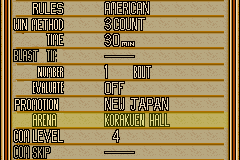 This translates just about everything with the exception of dojo mode. 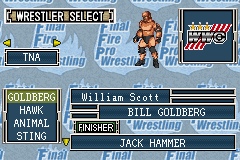 The wrestlers have their "Fire Pro" names too. 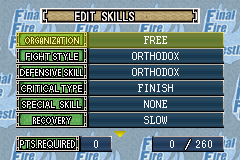 I've kept in some of the Engrish and added some of my own. 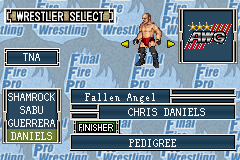 As above, however wrestlers are given their actual names. 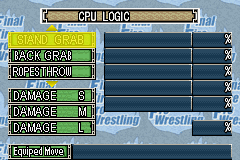 I have also updated EVERY wrestler costume, move set, stats, parameters and logic. I touch stuff up every so often. Below are a handful of costumes. 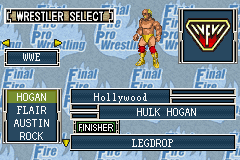 I'd screenshot them all but there are 244 wrestlers in the game. 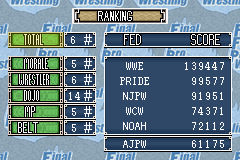 I've added real logos for NJPW, NWO, AJPW, NOAH, Zero-One, IGF (Replacing UFO), FMW, Michinoku, DragonGate, WWE, TNA, AAA, RINGS, Pancrase, PRIDE, UFC, BattleArts and WCW. It's not great but looking back on it I'm somewhat proud. 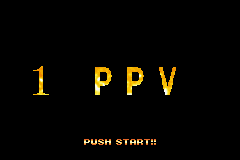 I have also included a patch that will replace the WPA and AWG logos from FP1/FFP/FP2 with the WWC and WFW logos from FPA. How do I patch my game? 1. 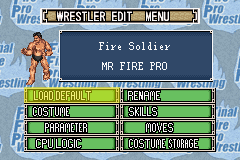 Acquire a ROM image of Final Fire Pro Wrestling. Don't ask where from. 2. Download my patches from here! 3. Download Lunar IPS here! You can use others but this one works well. 4. Unzip every file into the same folder. 6. 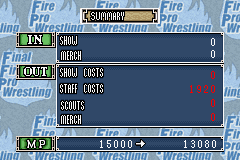 Click "Apply IPS Patch"
Add the logo patch after you've patched with the translation or full patch. 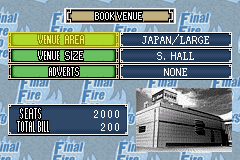 What do I play the game on? 1. 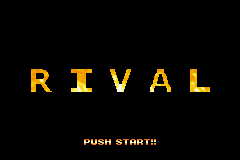 Download Visual Boy Advance. 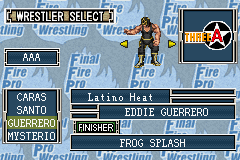 I have about 10 copies of the ROM to allow for 10 different saves. Runs the game perfectly, excellent for playing and simming. I have an HTC Wildfire and only recommend it for MOR or simming. You must save straight after. 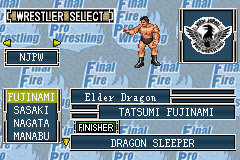 Originally I had the FPC URL however when Misawa passed I felt this was a fitting tribute. I still remember the moment I found out. 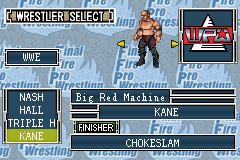 I was working a trainee show in London against the academy champion. He told me as soon as I walked through the door. cactusj00 - Without him I would have accomplished precious little! Jason Blackhart - Obvious really! Davey - Helped out in a big way. Phil Parent - No direct help but I've used his saves and edits as inspiration through this. My fiancée - She is the first person outside the FP community that knew about my patch and has done a fair bit of proof-reading and colour checking for me. She's even seen my Sonic the Hedgehog notebook and hasn't left me!